The World of Disney has changed what people think of as modes of transportation. Movies, animation, and park experiences allow us to see different ways to get from one destination to another. 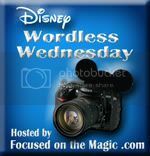 This week, the theme of the Focused on the Magic Wordless Wednesday is Disney Transportation. Rather than keep it simple with the magical monorails, I went a little outside of the box after the first photo. Please fasten your seat belt and enjoy the ride. Love all your photos, really like the Buzz and Woody one!! Oh I hadn’t seen the buzz and woody lego, really cool shots! Thanks for sharing! These are some really cute and creative photos! Love the view of Dumbo. Thanks for sharing! GREAT way to capture the theme- your pics are vibrant! Great shots! I love it when you think outside the box! Buzz & Woody=very clever! Thanks so much for sharing and for joining in on the DWW Blog Hop today. Onna´s last blog post ..What’s your favorite way to get from Point A to Point B? Great shots. I love all the Disney cars and transportation objects. So much so that we have the Disney Racer Monorail and Bus, and toddler ones some for my son too! Great shots and collection of Disney transportation and for going outside the box. I love the dumbo and circus train ones. I love your pictures! My kids (and me too!) are always so impressed with the Buzz and Woody display at the LEGO store! Great idea to include it!